Katsu chicken is more usually found served with curry sauce and rice, but this works so well with the more flavoursome ramen broths, for its crunchy texture and delicate flavour. As long as you place it carefully on top of your noodles and broth, it will keep its crispiness. You can cut it into slices, if you prefer, but I quite like the look of it served whole. Panko breadcrumbs are a light Japanese breadcrumb and are now easy to find in the oriental/ cooking section of most supermarkets. Put the chicken into a bowl and pour over the rice wine. Sprinkle with a little salt and pepper and leave for 15 minutes to infuse. Pat the chicken dry on kitchen towel, then sprinkle with the flour. Sprinkle the breadcrumbs onto a large plate, then dip each chicken piece into the egg and then the breadcrumbs, using your hands to pat them onto the chicken. Prepare a large plate with several layers of kitchen towel and place in a warm oven. Heat the oil in a small saucepan on a high heat. Allow enough oil to cover the chicken. When hot, lower the heat slightly (you may have to keep turning the heat up and down slightly to keep the chicken cooking and stop the oil overheating) and place several pieces of chicken into the oil. It will immediately spatter and start to cook. Using a slotted spoon or Chinese spider to turn the chicken over after a minute and then remove after 3-4 minutes. Place the cooked chicken pieces on the plate with kitchen towel and return to the oven to keep warm. Cook all of the chicken in this way, skimming out any stray bits of panko that float in the oil between batches. If you are cooking for a large number, these can been cooked in advance and reheated in the oven to crisp up again, but they are best when freshly fried. 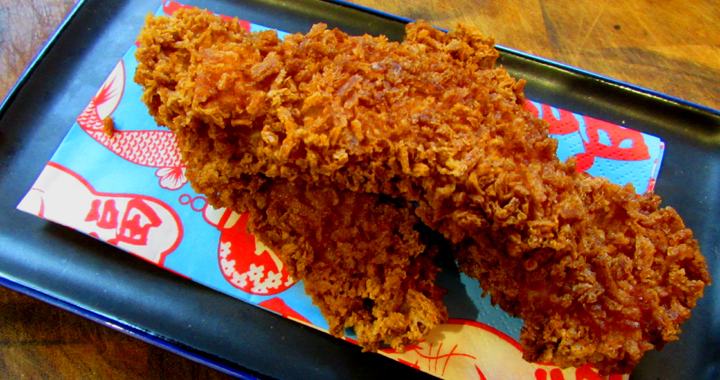 Posted in Main Dishes, Recipes, Toppings and tagged Chicken, Katsu, Toppings.